Penn Recycling, Inc. is able to purchase and remove any accumulation of scrap vehicles, loose tin and light iron and unprepared steel from customer’s locations. Company crews utilize a variety of equipment such as automobile crushers, super logger balers, rubber-tired bucket and fork loaders and track loaders to process and load scrap materials accordingly. 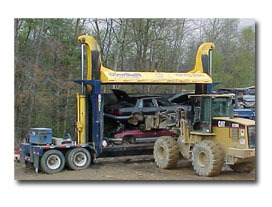 Specialized car and bale hauling trailers are utilized to transport the flattened scrap automobiles and bales to the Company’s shredding and shearing facilities in Williamsport for further processing.